2. Snails can have a long life. The life span for snails depends on their habitat and the species. Some of them only live for about 5 years. However, others in the wild are believed to be up to 25 years old in unusual occasions. 3. There are huge snails. The largest land snail recorded was 12 inches long and weighed near 2 pounds. It belonged to the Giant African Land Snail species. Other species are extremely small being only a few centimeters long when they are adults and weighing just a couple of ounces. While moving, snails they leave behind a trail of mucus. This mucus acts as a powerful lubricant to reduce friction against the surface. This is why they are able to move upside down, around corners, and other situations. It is a myth that this mucus is going to make humans ill. 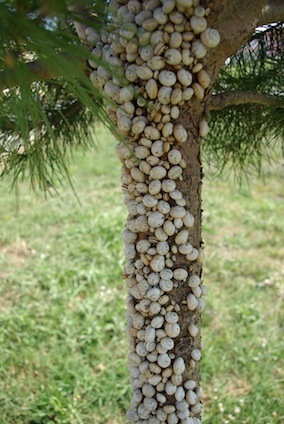 Many people worry that snails being in their garden will ruin the foods grown there and make them unfit for consumption but that is all false. 6. Living with no rush. Garden snails (helix apersa) a top speed of 50 yards per hour, this is about 1.3 cm. per second. While they don’t move fast, they do move at a very steady pace. The snails are one of the slowest creatures on the entire Earth. Snails have the reproductive organs of both, males and females, which categorize them as hermaphrodites. However, they cannot create offspring on their own. They must mate with another and then both of them will have the ability to lay eggs. 8. Snail can see and hear. Most land snails have two set of tentacles, the upper one carry the eyes, while the lower one has the olfactory organs. They are nocturnal animals, which means most of their movements take place at night. Snails don’t like the brightness of sunlight, which is why you will find them out more on cloudy days. If you keep on in an aquarium you want to make sure that too much sunlight doesn’t filter into the room. This can cause the snail to stop eating and to spend most of its time inside of the shell. Snails range in size from a few centimeters to 12 inches in length. Snails will die if you put salt on them. Make sure you don’t offer these types of items to them when you see them or when you have one in captivity because their body can´t process these items. The Giant African Land Snail is known to eat more than 500 different types of plants. Snails are very strong and can lift up to 10 times their own body weight in a vertical position. It is believed that there are at least 200,000 species of mollusks out there including snails. Although only 50,000 have been classified.